A subset of cells can be extracted into a new raster in several ways—by a selecting an attribute or a defined shape or by using another raster. Cells that meet a specified attribute query can be extracted to a new output raster with the Extract by Attributes tool. Examples of applications for this tool include the extraction of all cells that have a slope greater than 10 percent or the extraction of all cells attributed with zoning for commercial development. All cells that meet the query will return, for the cell location, the original value that was queried. The cells that meet the specified query do not have to be contiguous. You can extract cells based on a specified shape. You have the option to extract only the cells that fall inside or outside the shape. You can extract by a circle, rectangle, or polygon. To perform a circular extraction, use the Extract by Circle tool. The location of the center of the circle and the radius must be specified. To perform a rectangular extraction, use the Extract by Rectangle tool. The lower left and upper right corners of the rectangle must be identified. In the image below, the cells inside the specified rectangular shape were extracted. To perform an extraction based on a polygonal shape, use the Extract by Polygon tool. The location of the vertices of the polygon must be input. In the image below, an extraction polygon was identified, but a parameter was specified to extract the cells outside rather than inside the polygon. Cells can be extracted based on their spatial location. The cells to extract can be determined by individual point locations or from a group of locations of any size or shape as identified by a mask. You can extract particular cells from a raster by defining a list of the coordinate points you are interested in. To perform an extraction based on points, use the Extract by Points tool. The points must be identified by their x,y coordinate locations. Another dataset, the mask, can be used to identify the cells that will be extracted to a new raster. 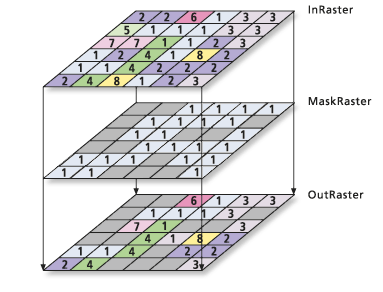 The mask can be either a raster or a feature dataset. To perform this type of extraction, use the Extract by Mask tool. There are a number of ways to create a mask raster using various ArcGIS Spatial Analyst tools. In the extraction tool, as demonstrated in the image below, those locations that are not NoData in a mask raster will retain the value assigned to that location in the Input raster. A feature dataset can be used for the mask. Only cells that fall within the specified shape of the feature data will receive the values of the Input raster on the output raster.